An optimum sailing experience on an energy-efficient catamaran without a combustion engine. Is that possible? A catamaran without an internal combustion engine. Is that possible? The most frustrating thing for a sailor is having to start up that smelly, noisy diesel engine. Not only when coming into or departing from a port, but also for cooking, showering or reading, etc. Christophe Schepens, CEO of Optimus Yachtbuilders, approached Hans Haagdorens at VLAIO to find out whether it would be possible to build a catamaran that was capable of operating without a combustion engine. Hans introduced Christophe to the SME team at VITO and to the battery storage experts at VITO/EnergyVille. The challenge was clear – how far can you get using solar panels, batteries and a cleverly designed electric motor? Do you have to compromise on comfort and convenience? Our experts developed a range of different scenarios based on usage profiles. This ensures that generating and storing solar energy is aligned as closely as possible with energy demand, but the location is another important parameter. After all, the yield from solar panels is heavily dependent on the region in which the sailing boat is located: Antwerp, Norway or French Polynesia, for example. VITO/EnergyVille was able to provide the answer by calculating the amount of solar energy available. In addition, the electric motors can act as generators when the boat is sailing, with all of the resulting energy being stored in two large banks of lithium batteries. And the energy is subsequently transferred to a smaller third battery that is used during the daytime. The yacht performs even better than originally envisaged during the design stage and there is a great deal of interest. Since the project was originally launched and announced, enquiries have been coming in from home and abroad and from countries as far away as New Zealand. 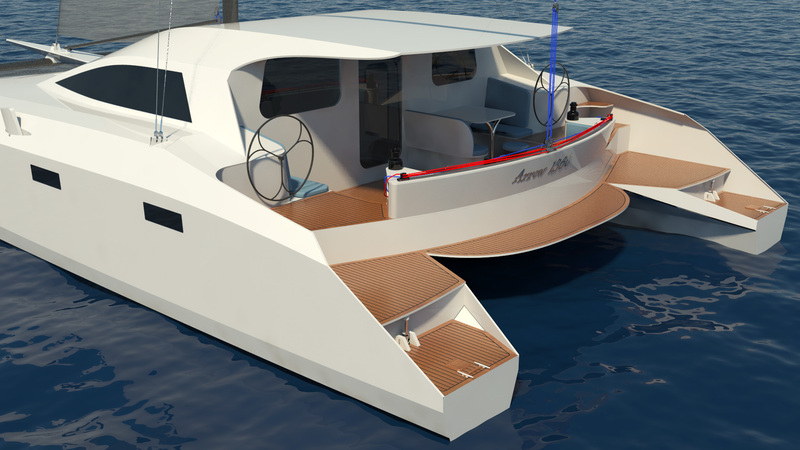 In spring 2019, the Catamaran 45 will be the first zero-emission boat to reach the market. In order to examine how far we could get without an unpleasant-smelling diesel engine, we turned to VITO/EnergyVille. And what do you know? It turned out we could actually get quite far! EnergyVille worked out a variety of scenarios, calculating the size of the batteries and establishing the solar yield we could possibly achieve, anywhere in the world. And the result of this is that zero-emission yachts are the only yachts we now produce. Stay informed of our recent developments, newest projects and upcoming events.